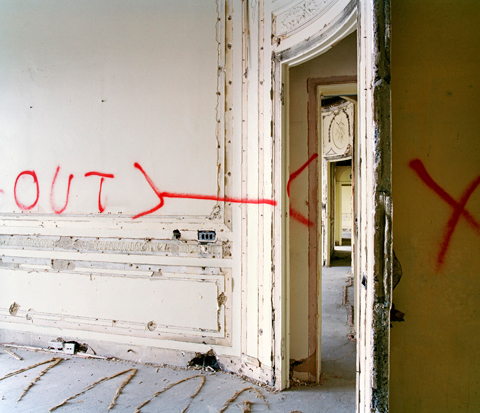 In 2006, Siobhán Doran photographed the famous St Pancras Hotel in London – then a derelict shell awaiting restoration. 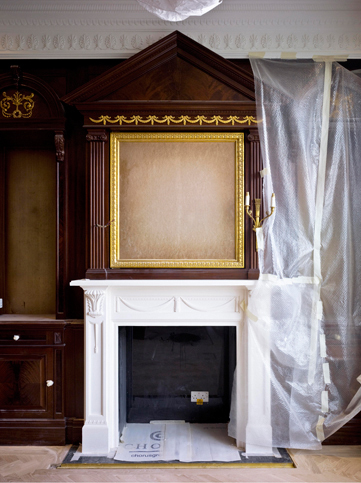 For this Showcase she is interviewed about her project documenting the equally ambitious restoration of The Savoy, a prestigious and world-renowned hotel on London’s Embankment. Originally a Victorian hotel, The Savoy enjoyed fame during the 1920s for a major art deco redecoration, and for hosting guests as varied as Noël Coward, Igor Stravinsky, Josephine Baker and George Gershwin. Siobhán’s work has culminated in the book Savoy | The Restoration, which presents the restoration project over four periods: The early days (stripping out, and in many instances exposing original detail); the painstaking structural restoration; progression into new designs and the finishing touches of decoration and furnishing. Siobhán initially proceeded more by intuition than design, however she soon became captivated by the hotel’s fifth-floor River Suites with their varied views across the Thames. Born in Ireland and now living in Hertfordshire, Siobhán initially trained in architectural technology and spent over a decade working in building design before undertaking a degree in photography at the University of Westminster, graduating in 2006. She set up as a freelance artist in September 2007, focusing on both personal fine-art projects and working with the design community to create commissioned artwork, and photographing interiors and exteriors of recently completed buildings. LIP: Did the Savoy project start out as a commission for you, or a personal project? Siobhán: A bit of both, or at least I tried to make it both. It started as my idea and I put a proposal to The Savoy to commission me. The project began when my friend Rachel told me about the impending closure and subsequent restoration of the hotel. From this initial conversation, Rachel set up a meeting for me with the client representative for the restoration project. He liked my work and arranged for me to then meet with The Savoy management so I drafted a proposal. My very first thoughts were to work towards a publication; here was a building with a grand history, a huge following and a service undisputed in luxury living. From the beginning I knew it was without doubt an exciting and important project. This added to my disappointment and frustration when my proposal was initially turned down! LIP: You have photographed other grand hotels previously, did that work prepare you for your work at the Savoy? Siobhán: From 2002 to 2006 I studied a part time degree in photography at the University of Westminster. For my final degree project, I produced a book called Grand Hotel, set at St Pancras, now known as St Pancras Renaissance Hotel. I had been photographing in St Pancras Chambers for six months prior to its renovation; it was empty and unused for many years. From these visits I put together a collection of photography and text that I had captured and researched about this wonderful building. In a sense that experience, along with my background in architectural building design, prepared me for the days on The Savoy site. St Pancras taught me that with patience and time, a story would evolve in the form of a photographic series – I tend to work intuitively rather than having it all worked out prior to a shoot. 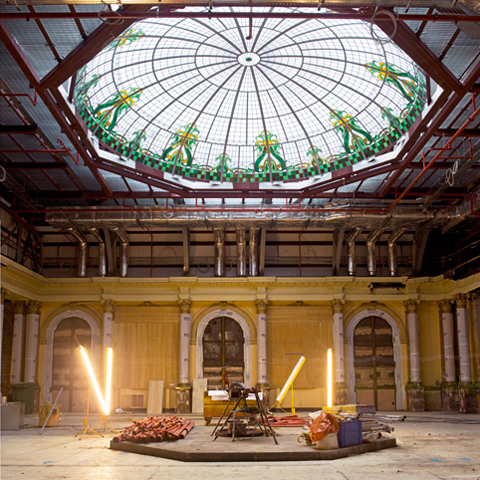 My architectural experience of building sites also prepared me for how an old building can look and feel on those long, dark and cold days when the lights are switched off and its occupiers have left. 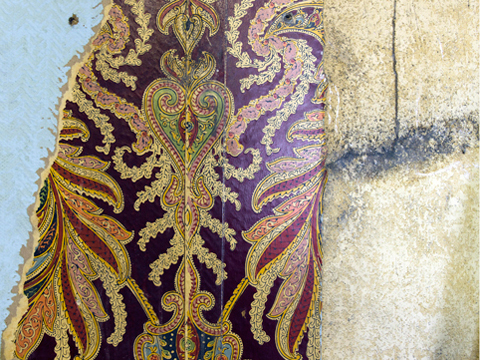 LIP: You made more than 100 visits to photograph the restoration which involves either a massive commitment or outright obsession – which was it for you and why? Siobhán: This makes me smile because I can see how one could consider it an obsession. I was often asked on site what it was I was capturing, and how many photographs must I have taken, usually from a bewildered face! It was definitely a commitment, however I had just quit my architectural design job and had decided to commit to photography full time. Leaving a secure job to take up a profession that doesn’t have a good history for securing financial return was a much bigger commitment. I suppose all things are relative! I agreed to submit my photographs to The Savoy every three months, which formed the structure of my new career and it was from this project my practice evolved and grew. The Savoy project was not just a commitment; it was the platform to my new career. LIP: It must have been a thrill having exclusive access to photograph such a legendary building, it’s not just an architectural gem but also has a rich social history. Can you talk about any times during the project that stood out for you? Siobhán: It was always a great privilege to be on site although on saying that, it seemed a straightforward process to propose the idea and get access. Sites are not all they are built up to be and the first year was dark and depressing, so the thrill tends to be more in the idea of it rather that the reality. However the dark and depressing aspect is a draw for me and it was during these visits that I had the building to myself and had time to explore and seek out its history and soul. There were many moments that stood out, that made me feel so fortunate to be there; to be able experience this piece of history. 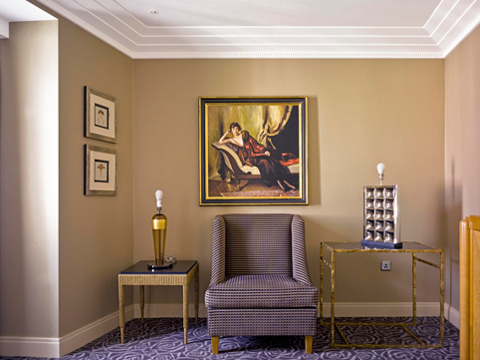 One in particular is the Royal Suite, River View, The Savoy, January 2010 (above). It was after work hours and the building was empty but for security and myself. I was walking through half built rooms and this picture caught my eye. I stood and observed this majestic view while all I could hear were the faint sounds of car engines passing by. The Savoy’s Embankment location overlooking the Thames, with wonderful views of Cleopatra’s Needle and the Houses of Parliament, is unrivalled amongst London hotels. Richard D’Oyly Carte was lucky to acquire a plot of land facing Embankment Gardens, just south of the Savoy Theatre, and clever enough to realise the potential of the view by designing his new hotel with wide balconies that ran all along the riverfront. Although the balconies are long gone, the 2010 restoration has allowed the architects to ensure that windows on the river side maximise the iconic Thames views. 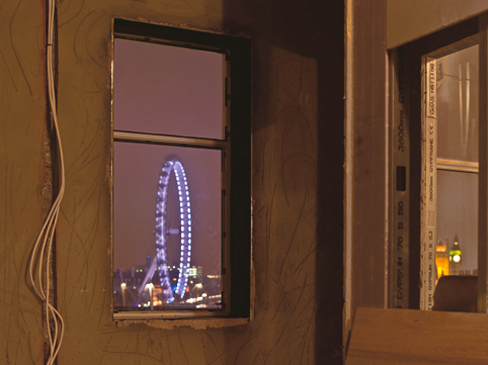 D’Oyly Carte’s vision has been supplemented by the addition of the London Eye to the skyline, and the magnificent view at night-time when the city is illuminated. LIP: Can you explain a bit about the significance of this grouping of images? 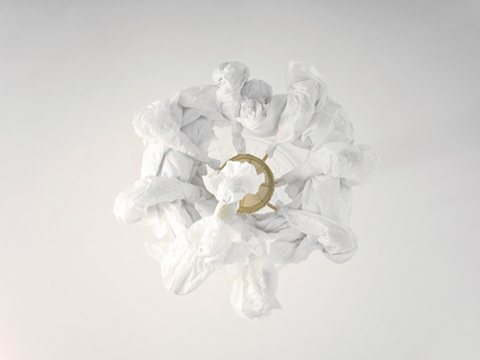 Siobhán: Initially I set to work during the Savoy Sale, the December 2007 auction staged by Bonhams at the hotel. I decided to photograph the nine River View suites stretching across the fifth floor during the two-day event. It was the only time I could shoot these rooms, as prior to the auction they were fully booked. The Savoy’s fifth floor is its centre, and every room has a spectacular river view, each offering a unique perspective. The three central rooms make up the Monet Suite, where Impressionist artist Claude Monet painted some of his stunning watercolours when his usual 6th-floor suite was unavailable. In each room, the desk and chair – which I repositioned to face the window – represented to me the people who have passed through the hotel during its 118-year history. 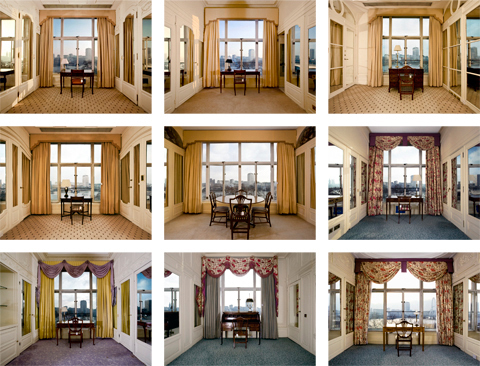 The furniture was affixed with Bonhams’ auction tags which signifies the present, while the view of the River Thames, Royal Festival Hall and the London Eye grounds each image, establishing a sense of the hotel’s London presence and also symbolizing its future. So the sequence ponders the Savoy’s past and contemplates what is set to come. I repeated this sequence a number of times over the restoration period and these groupings form the beginning of each chapter in the book. It was the first set (seen here) that made me realise I had found a concept for my project early on, which gave me the enthusiasm to pursue it rigorously until its completion. LIP: It seems this project was quite demanding in terms of research and writing of the text to support the images for the book. Is this a process that you generally enjoy doing alongside your photography, or was it a function of necessity for documenting the transition at The Savoy? Siobhán: The text was put together after the main body of photography was complete. I had been capturing the restoration for almost three years when the prototype book was conceived. Over this period I kept a scrap book of notes and ideas. As mentioned before, from the beginning I saw the final piece as a book so text ideas were always churning around in my head! For me it comes hand in hand with photography, I like to add words to an image or a series. My intention with text is not to explain the image away but to add another dimension or intrigue, either in the form of prose or poetry. Some of the first days I spent at The Savoy were with the hotel’s archivist Susan Scott, just before the archive was stored away for the restoration period. It was during these days that I became more informed of its history and clientele. I sat in a room sifting through old newspaper articles and client cards, reading stories and details of The Savoy’s history and visitors. These stories stayed with me through those long days exploring the hotel with my camera, and I am sure they informed my final work albeit unconsciously. LIP: How was your experience working with a publisher (Dewi Lewis) during the making of the book? Did you encounter difficult challenges along the way? Siobhán: It was a real learning curve because as it turned out the photography aspect of the book was not my only role. I became project manager and therefore responsible for the entire book content which included design and text. By going to EBS offices in Verona, Italy, to oversee printing with Dewi Lewis Publishing, I was made aware of the mechanics of book construction and the approval process. It was during this experience that I learned so much. It was very exciting and rewarding. Dewi has 25 years experience in book publishing so at times I did feel a little out of my depth, but he was very approachable and relaxed about explaining the process. After all, it may be my first photography book, but I do know from experience when you are new to a subject that it’s totally acceptable to ask questions no matter how trivial. It was a fascinating week understanding the process involved in book publishing. A printing day is made up of three shifts – for authors and publishers this equates to long days being on hand to approve each stage and page! At EBS the quality is superb and the expectation from all involved is perfection, or as near as the technology can allow. The results are beautiful crafted art books. When I left late on the last night, pallets of my pages awaited pick up for the binders… all very exciting and educational. LIP: Inevitably the Savoy has been a solid foundation project for shaping your new career, and will present exciting opportunities moving forward. Have you been taking on new commissions since, or do you know what comes next? Siobhán: There is a lot going on at the moment and this has been my busiest year since starting in 2007. My architectural and interior work is gaining momentum and it takes up around half of my time. 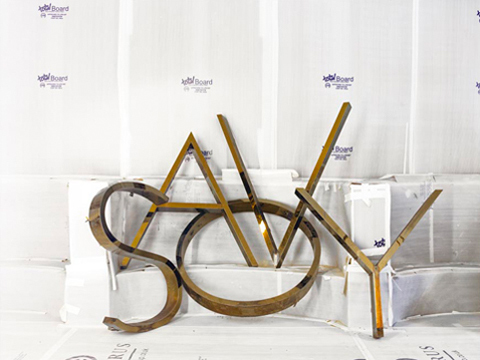 The Savoy project is still in the forefront of my work though, as I have been preparing for my solo show Savoy | The Restoration over the last couple of months. The show runs 14-20th June at 81 Leonard Street Gallery (previously AOP Gallery), and I am showing 34 photographs from the book. One of the photographs was selected for the Royal Academy Summer Exhibition, which is a real honour. To my delight the print is also selling well with only one of the edition of nine left when I last checked. The exhibition and private view was organised and curated by Bryony Fraser, co-founder of alacARTe, who provide support and generate exposure for emerging artists. After the Savoy exhibition I’m scheduled to return to St Pancras after a six year break! I have plans for this project and hopefully something fruitful will emerge from that in due course. I am also documenting the refurbishment of University of Westminster, which I commenced a year ago. The first phase completes in September, in time for the new academic year, and 44 of those photographs are being exhibited as the inaugural exhibition at the newly relocated London Gallery West, opening September 13th. There are a few other irons in the fire with a couple of larger project possibilities including a major global head office and a high-end luxury hotel. I hope to secure some of these, as they are exciting projects which will allow me artistic license with prominent landmarks. I do not always know what comes next but I feel inspired right now and will continue to pursue both my commercial and personal work simultaneously. Photographers whose projects are presented in this Showcase are selected from the talented membership of London Independent Photography. All images displayed are copyright of the individual photographer and views expressed are independent of those of the publisher.